What is the Expansion Microcopy? Expansion microscopy (ExM) is a method for improving the resolution of light microscopy by physically expanding biological samples. It allows investigators to identify small structures in 3-D and with Nano-scale resolution by expanding them with a polymer system. In ExM, biomolecules and/or fluorescent labels in the specimen are linked to a dense, expandable polymer matrix synthesized evenly throughout the specimen, which undergoes 3-dimensional expansion by about 4.5 fold linearly when immersed in water . A recent paper reports that multiple applications of ExM expands biological specimens up to 20 fold, and enables ~25 nm resolution imaging of cells and tissues on conventional microscopes . Traditional light microscopy has limits of resolution that prevent it from reliably distinguishing small structures that are important for biological function. For example, synaptic vesicles are 40-50 nano meters in diameter, which is below the commonly quoted resolution limit of 200 nano meters required for light microscopy. There are a few methods to archive the nano meter scale image, such as Super Resolution microscopy and Electron microscopy, but these methods require special hardware that is complex and/or expensive. In addition, they are physically limited in imaging speed, number of colors, and/or in the volume accessible, as compared to diffraction-limited microscopy. ExM enables the nano scale resolution imaging with standard diffraction-limited microscope hardware already common in biology labs. Moreover, since ExM expands samples in water, final expanded specimen is ~99% water, and thus are essentially completely transparent and optical aberration free . Another benefit of ExM is the decrowding of biomolecules or labels by expanding them away from each other. This allows for more room around the molecules for chemical reactions to take place. This extra room can be used to perform signal amplification, so that rather than attempting difficult single molecule imaging in 3-D volumes of intact tissue, one can attach many fluorophores to a single-molecule biomolecular target. Which will allow the identification and localization of single biomolecules feasible in large volumes (as demonstrated for this method applied to the detection of single RNAs in synapses in intact brain tissue in , and shown in Fig. 2f, g). The purpose of this web site is to provide the information and tools for performing ExM procedures to every bioscientist familiar with immunohistochemistry. Fei Chen, Paul W. Tillberg, and Edward S. Boyden (2015), "Expansion microscopy", Science. 347 (6221): 543–548. Jae-Byum Chang, et al. (2017) "Iterative expansion microscopy", Nature Methods 14:593-599. Fei Chen, et al. (2016), "Nanoscale imaging of RNA with expansion microscopy", Nat Methods 2016;13:679–84. How does the Expansion Microscopy work? Biomolecules and/or fluorescent labels in the specimen are linked to a dense, expandable polymer matrix synthesized evenly throughout the specimen. These biomolecules then undergo 3-dimensional expansion by 4.5 fold linearly when immersed in water. If you apply this method multiple times, it expands biological specimens up to 20 fold and enables ~25 nm resolution imaging of cells and tissues on conventional microscopes. ExM requires chemicals and microscopes found in a typical biology lab or imaging facility, with the exception of anchoring reagents and sodium acrylate, which are available commercially at modest cost. Almost all the protocol steps can be carried out at room temperature on a wet lab bench. Basic equipment required includes a benchtop vortex mixer, a shaker, a 37°C incubator, a desiccator, a 4°C refrigerator, and a –20°C freezer. All the materials and supplies used in this unit are commercially available. There are several different protocols optimized for visualization of proteins, RNA, and other biomolecules. The latest protocols including material lists are available on ExpansionMicroscopy.org. ExM enables nano scale imaging of specimen with ordinary diffraction-limited microscopes. That means you can use standard image processing software for ExM. However, in ExM, a specimen is enlarged, and the images are captured many times to cover the entire specimen with the small FOV of a microscope. As the result, you need to handle a huge number of high resolution image files. The processing time depends on your analysis but it will generally take a long time. One of the purposes of this web site is to provide high performance tools to process these large number of image data. The software package, "ExM Studio", has several essential tools for ExM. We found the bottleneck in the entire process is in Deconvolution and Stitching. Deconvolution is one of the methods to reduce noise and sharpen the target image. Stitching is a tool to stitch one sequence of 2D image in 3D space, and create whole 3D image data. Both tools are important for ExM, but each computational time is relatively long. ExM Studio is a software package for ExM. It has the accelerated Deconvolution and Stitching software, and includes a few other support tools. Using ExM studio, you can start ExM right now. Stress-free. Each module is optimized and accelerated by NVIDIA GPUs. More details are described in Product and Performance sections. ExM Studio is a software package for Expansion Microscopy. In the latest version (version 0.1 on 11/12/2018), ExM Studio has the following two features discussed below. It also has a technical guide for the ExM image processing pipeline. We will continue to add other and more useful image processing and visualization tools accelerated by GPUs. Please stay tuned to this web site! In optics and imaging, the term "deconvolution" is specifically used to refer to the process of reversing the optical distortion that takes place in an optical microscope, or other imaging instruments, thus creating clearer images. It is usually done in the digital domain by a software algorithm, as part of a suite of microscope image processing techniques. (Wikipedia). There are several open source projects for deconvolution such as Deconvolution Lab2 , but most of these projects do not support the GPU acceleration. The algorithm of deconvolution is an iterative process to remove the effect of point spread function (PSF) for each image pixel, and it has quite a good fit with the GPU architecture. 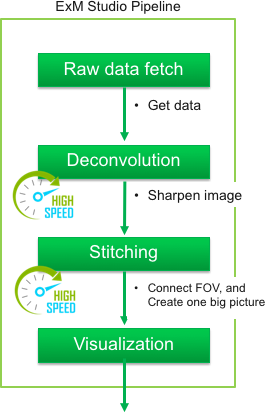 We developed a deconvolution software, optimized it for NVIDIA GPU, and achieved dramatically faster processing speed than other commercial/non-commercial deconvolution software. Stitching is the process of combining multiple images with overlapping fields of view to produce a high-resolution image. This process is necessary for ExM because you have to take a large number of images, combine them, and create large, transparent volumes of whole tissues and organisms. However, it's not an easy process because the raw data acquired by the microscope is not directly suitable for stitching together. Thousands of high resolution, overlapping 3D image tiles are collected which all amount to many terabytes of data in size and require image alignment. "TeraStitcher"  is one of the upcoming and promising open source software in this field and is designed for terabyte-scale 3D image data. 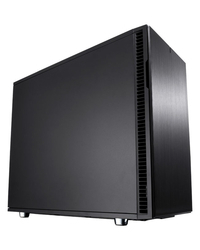 The core part is also accelerated by NVIDIA GPUs. The workflow of ExM Studio uses TeraStitcher in the stitching process. We provide a detailed document about how to use Terasticher for ExM, but it's not our software. Please accept their license before using it. As we explained above, the post process in ExM requires large computational resources to generate high resolution 3D images. Tools in ExM studio are optimized for the latest NVIDIA GeForce "RTX 2080" series, and this can yield several orders of magnitude higher performance than a conventional CPU. 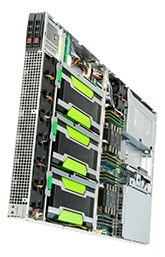 We developed a workstation/server with the latest NVIDIA GPU optimized in order to make ExM processes faster & easier. This ExM Workstation/Server is fully turnkey, built to perform right out of the box so that you can avoid the drudgery of configuration and setup. The hardware component is fully customizable to meet your budgetary needs. Contact us to configure the best system for you. The hardware comes with a 1 year limited warranty. We also offer an optional 3 years limited warranty. Owners of the ExM workstation/server will also gain our professional technical support for the ExM studio tools. In this section, performance evaluation results for each ExM tool are described. 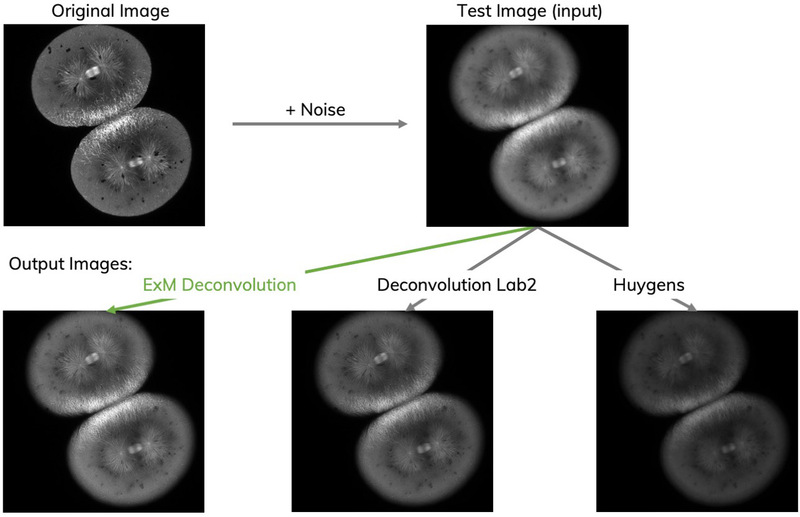 We measured elapsed time of ExM deconvolution software and compared the result with two other major deconvolution software: "Deconvolution Lab2" (Open source, GPL v2), and "Huygens" (Commercial license). Deconvolution Lab2 can be run on CPU (no GPU). The below figure shows the result in a speed up factor, which is a normalized value by the elapsed time of Deconvolution Lab2. As you can see, ExM deconvolution achieved 844 times faster than Deconvolution Lab2, and 15 times faster than Huygens. Note that this is the result on NVIDIA GeForce 1080 Ti, which is one generation behind. We have already confirmed that the latest board, GeForce RTX 2080, can achieve an additional 1.6 times faster processing speed than the GTX 1080 Ti. Output image quality is a more important factor for a deconvolution software than its processing speed. We created several different test data sets to compare output images generated by each deconvolution software. Fig 5 shows results of one of those data sets. Original image, test input image, and output images generated by each software are shown in this figure. In this data set, as you can see, the output image of ExM deconvolution well reproduces the original image. Its image quality is almost the same as the output of Deconvolution Lab2. The Huygens result was a little darker than others. ExM studio is using TeraStitcher as a default stitching software. In general, stitching has several different image processing stages. The most time consuming part of the stitching process is the calculation of the displacement between tiles. TeraStitcher does this calculation by evaluating the Normalized CrossCorrelation (NCC) between the Maximum Intensity Projections (MIP) of the tiles. NCC is a variant of the classic Cross Correlation in which data are normalized by subtracting the mean and dividing by the standard deviation of the two datasets . For TeraStitcher, you can run this NCC process on NVIDIA GPUs. The below figure shows the elapsed time of the NCC process running on CPU and GPU. The GPU version was able to achieve 3.8 times faster performance for the CPU version. For more details, visit TeraStitcher's web site. Copyright © 2018 Fixstars Solutions Inc.